Update May 2014: Lazy Dog is opening in June. Updates on Maria's at www.mariasitaliankitchen.com/blog/marias-fast-casual. The Collection at RiverPark in Oxnard recently announced that The Lazy Dog Restaurant & Bar and Maria's Italian Kitchen Pronto are scheduled to open in spring 2014. With 12 locations and several more on tap, the Lazy Dog Restaurant & Bar has become known for its warm, comfortable, yet exciting lodge-like setting that is the perfect dining spot for all ages for a quick dinner with the family, a meandering meal with friends or a night out on the town. Lazy Dog has a popular location at The Oaks in Thousand Oaks. Maria’s Italian Kitchen Pronto offers great Italian food at affordable and reasonable prices served quickly or on-the-go, with nine locations. Other upcoming new additions coming to The Collection include Settebello Pizzeria, scheduled to open in September, Famous Dave’s, and Toby Keith’s I Love This Bar and Grill, both scheduled to open in late 2013. Other restaurants and eateries already open at the 650,000-square-foot center are Kabuki Japanese Restaurant, Five Guys Burgers and Fries, Panera Bread, Starbucks, Menchie’s Frozen Yogurt, Gandolfo’s NY Deli. The Collection at RiverPark is rapidly taking shape alongside Highway 101 between the Vineyard and Oxnard exits. Anchors include the recently opened Whole Foods Market, Target, a 16-screen Century Theatres, REI, and the soon to open 25,000 SF H&M mega store. In addition to dining, shopping and entertainment, venues, The Collection will incorporate 60,000 square feet of office space above the retail on the main street as well as an extensive public art program featuring the works of nationally and internationally recognized artists. 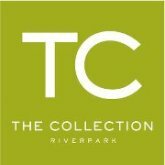 For more information, visit us on all social channels at TheCollectionRP.